By Desmond Sam, 9th Grade, LaGuardia High School Million Dollar Quartet is a tribute to four musical geniuses of rock 'n' roll and allows you to join in on the fun.Million Dollar Quartet is a recreation of a legendary moment in music history. This musical retells the impromptu jam session of Elvis Presley, Johnny Cash, Jerry Lee Lewis and Carl Perkins held at Sun Records Studio the day before Christmas in 1956. The show focuses on their brilliant music and barely touches upon their unstable lifestyles. Million Dollar Quartet is a showcase of nostalgic remembrance of a time when youth expression was starting to explode and become a key component of the fabric of America. The show helps young people today understand the roots of our music. The performer who stands out the most is Dyanne, Elvis Presley's girlfiend, played by Victoria Matlock. She is the only woman in the show and her vocals take control. The music is a collection of hits that have become household favorites, including "Fever," "Great Balls of Fire," and "I Walk the Line." The music has people dancing in their seats, reminiscing about the first time they heard each song. The actors' impressions of each singer is completely believable. 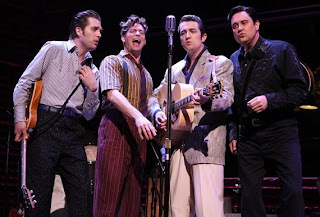 Million Dollar Quartet is an easy-going musical that will delight your soul and make you tap your toes. TICKETS: $30 lottery rush • Nederlander Theatre, 208 W. 41st St.